As I mentioned before, I do like Spanish wine. It is very easy to drink and also affordable. Since I was doing a food and wine trip for my birthday, it was only fitting that I spend my actual birthday in Rioja, the most famous wine region in Spain. 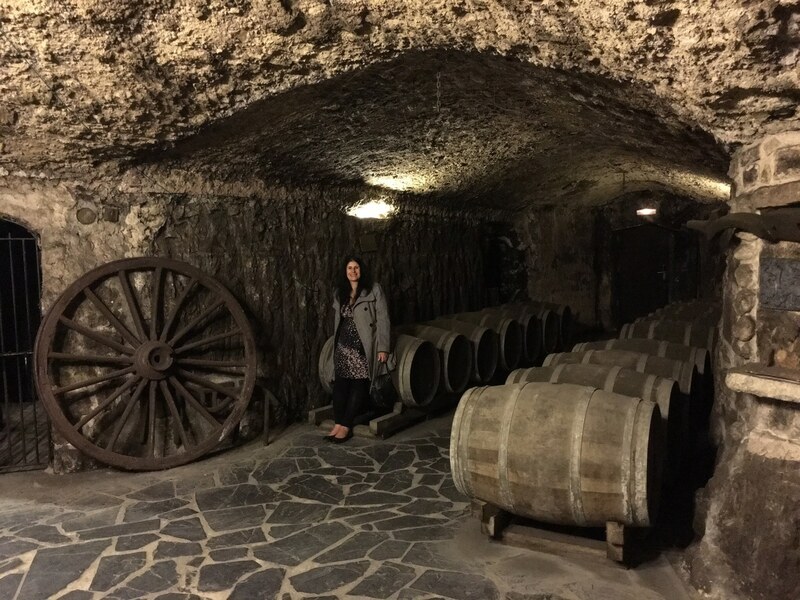 We only had one day and wanted to pack in as much as possible, so we decided to splurge and do a private Rioja Spain wine tour with Basque Tours. We planned to visit four wineries for tastings, one for lunch, and then also see the medieval walled city of Laguardia. 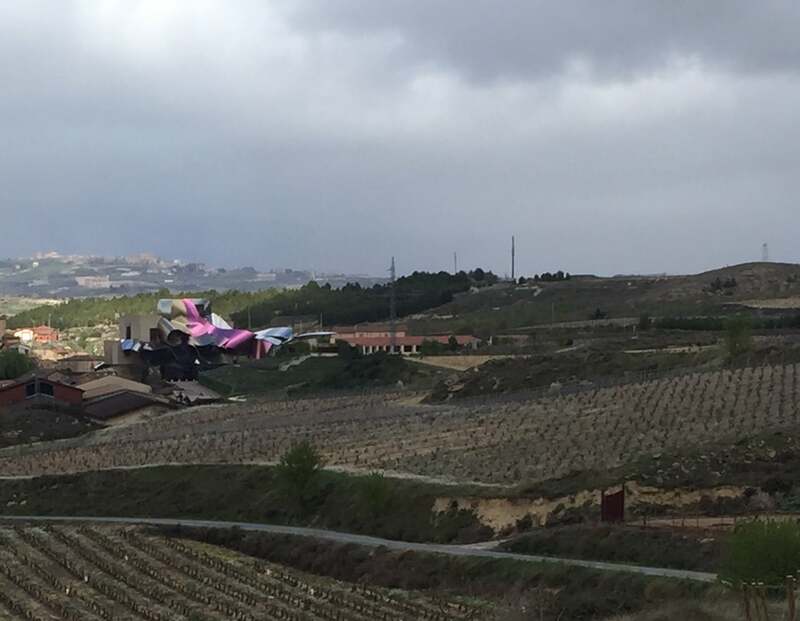 There is a nice view of the Rioja region from just outside the city walls of Laguardia. Andoni was our driver and tour guide. He picked us up at 8:30 am in San Sebastian and we headed to Rioja. We made sure to eat breakfast before we left. It took about two hours to drive to our first winery, so Andoni gave us an overview of the region and Spanish wine. Some of the best wineries in Spain are located in the Rioja region. The region has three sections – Rioja Alta, Rioja Baja, and Rioja Alavesa. We would be visiting Rioja Alta and Rioja Alavesa. 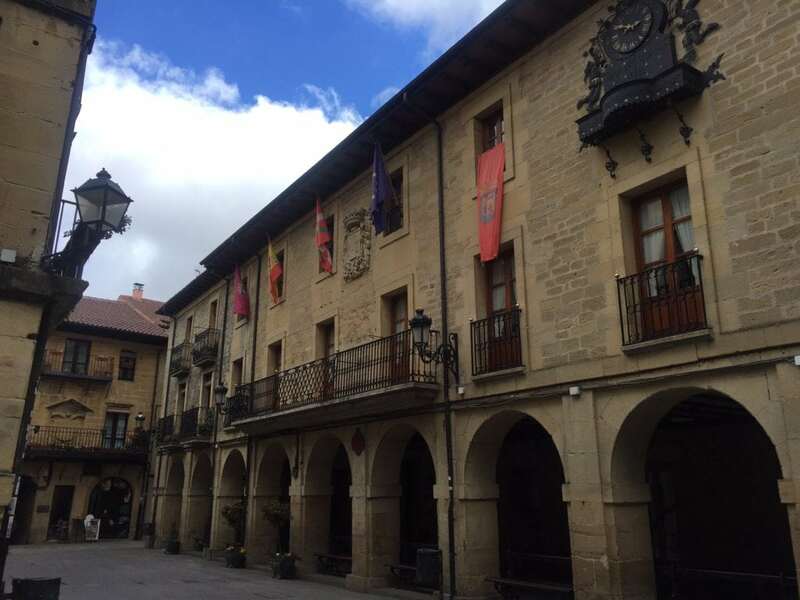 The town of Haro (in Rioja Alta), is the wine capital of the region and we would be visiting several of the best Rioja wineries there. 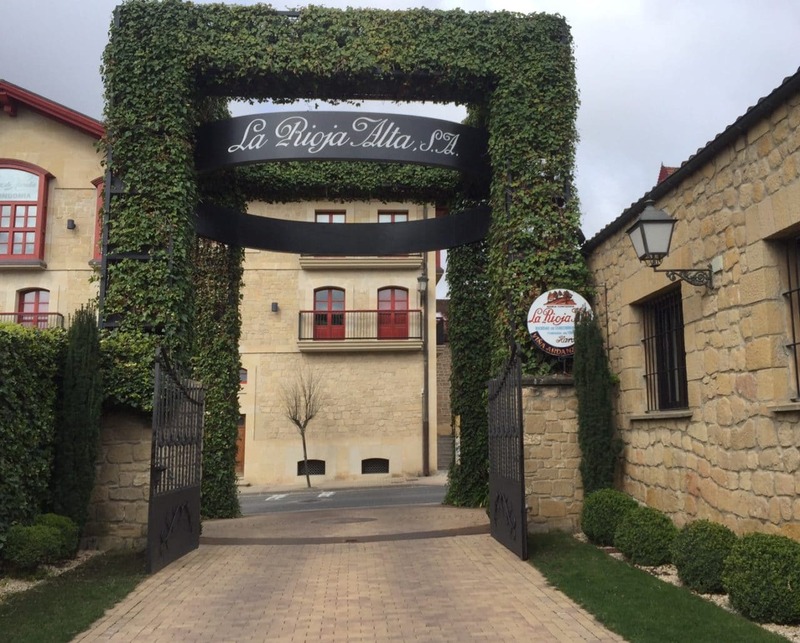 The entrance to La Rioja Alta tasting room. In Spain, they refer to regions as denomination of origin and there are more than 50 of them! Each one has its own regulations and specifications for bottling. The regulations in Rioja are actually pretty helpful for casual wine drinkers like myself. You look on the back of the Rioja wine label for the colored sticker and then you have a good idea about the quality/age of the wine. If the label is red it is a Crianza, which has been aged one year. Purple means it is a Reserva, which has been aged two years. The highest end wines are Gran Reserva and have a brown sticker. Andoni told us that they would use the cheapest wines to make Kalimotxo, which is a mixture of red wine and Coke (not Pepsi! ), which I will have to try at some point. 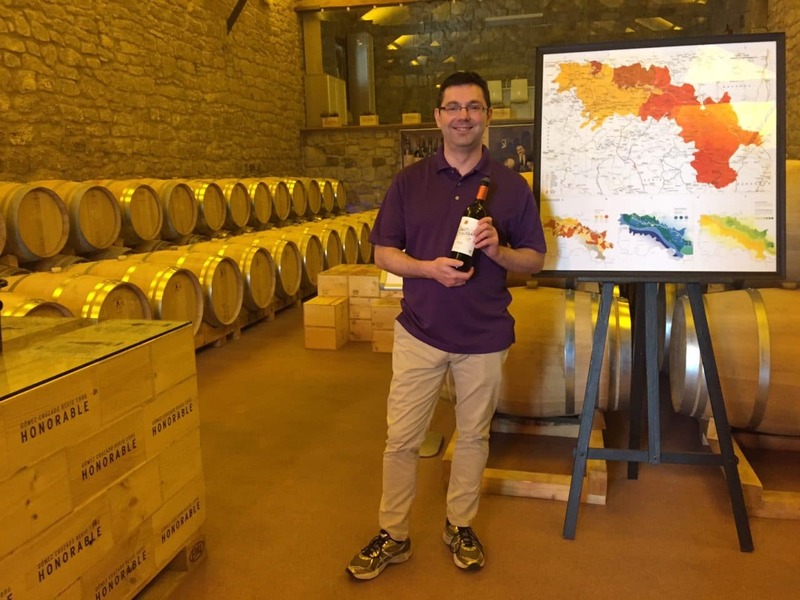 You could tell Andoni was very knowledgeable about Spanish wine and Basque Country. Here is an example of the label. 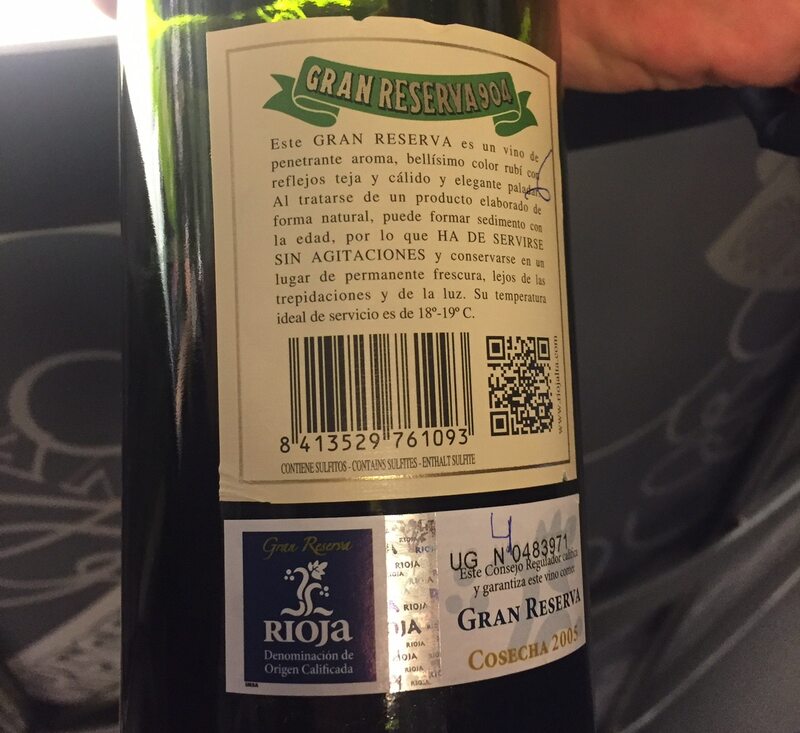 You can see the brown sticker denoting that this Rioja wine is Gran Reserva. These are the types of wines you save for Christmas Dinner! 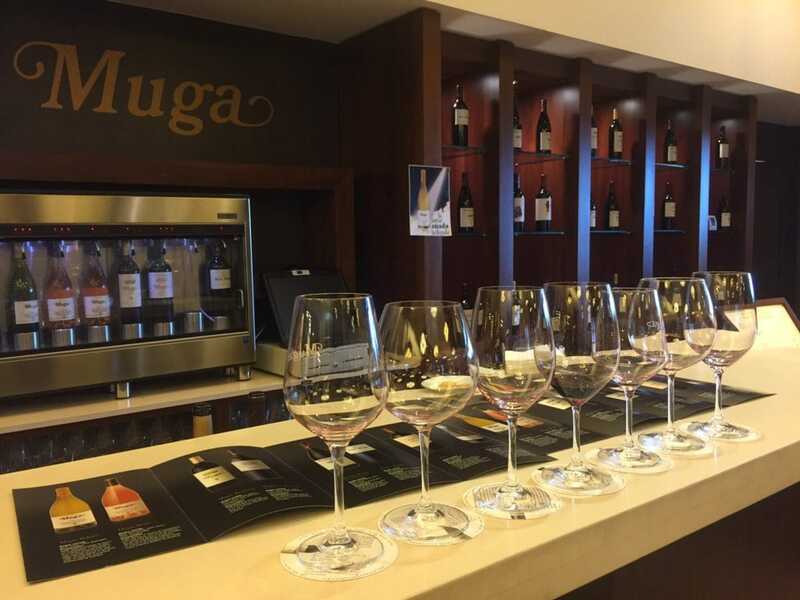 The first winery we visited was Muga in Haro. This winery felt like an upscale Rioja wine bar. I was impressed with the pours, they were not stingy. Our tastings were more like full glasses and because of a mix up we got an extra glass of wine to share. We didn’t even have to do any sweet talking! They also had crackers so that we could cleanse our palettes. Our mostly empty glasses from our tasting at Muga. It was nice that the coasters provided information about the Rioja wine you were drinking. We learned quickly that shipping to the US or even the UK was ridiculously expensive. Most wineries work with distributors globally, so just ask for the list of distributors and buy it once you get home. Of course, you can also buy directly from the winery, but you can only fit so many bottles in your luggage. Plus some countries may have restrictions on how much wine you can bring back without paying a tax. Our Rioja tasting at La Rioja Alta. We visited two other wineries in Haro, that were just a short drive away. La Rioja Alta also had a tasting room that felt like a wine bar. They gave me a corkscrew as a gift. Then we walked across the street to Gomez Cruzado. Here we tasted the wines in the barrel room. Next, we drove to Rioja Alevesa, which was not too far and the countryside was beautiful. We went to Ostatu for our next tasting. You could feel that this was a smaller family-owned winery. Russell modeling the Gomez Cruzado wine in the barrel room. 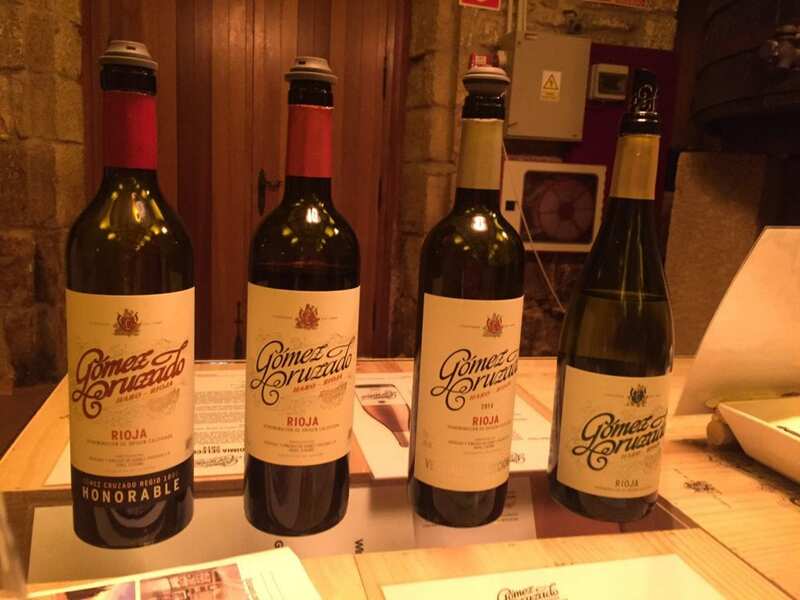 The wines we tasted from Gomez Cruzado. 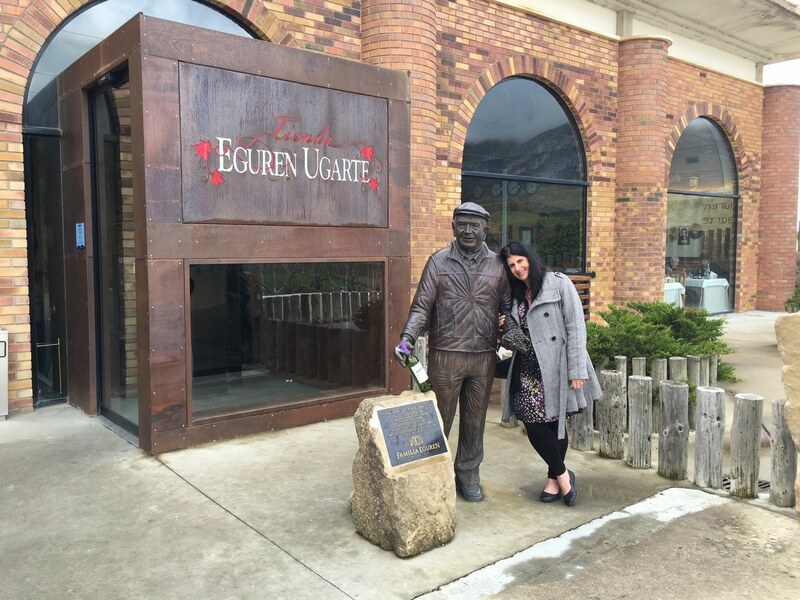 We ate lunch at the Eguren Ugarte winery and it was just perfect. The back part of the winery was caves and that is where we had our food. 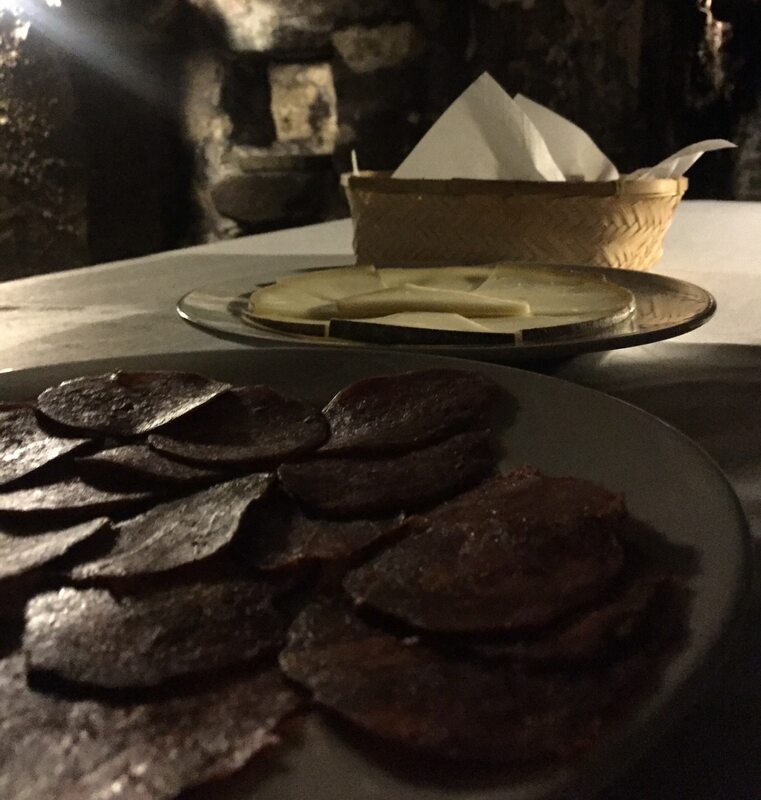 It was a simple but tasty lunch of jamon, cheese, and baguettes that paired perfectly with a bottle of Rioja Tinto. By this time we were feeling the wine so we couldn’t finish the bottle. It wasn’t a problem though, they packaged it up for us to take with us. We drank it the next day. How amazing are these caves?! Meat, Cheese, and Bread went perfectly with the wine. After lunch, we headed to visit Laguardia, a nice medieval walled town on top of a hill. We got great views of the countryside and it was nice to take a walk after all the food and wine. You feel like you have gone back in time. Also, it would be the perfect setting for a Renaissance Fair. 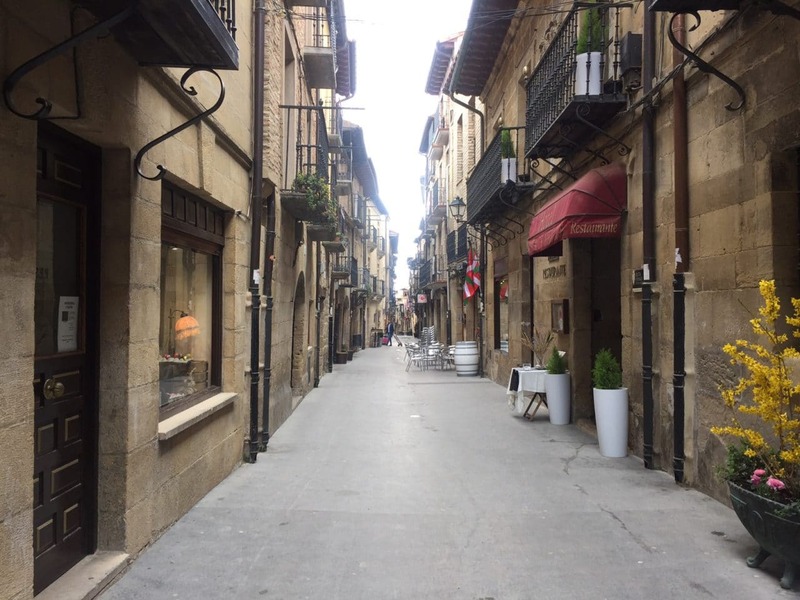 One of the many cute streets in the medieval town of Laguardia. Plaza Mayor is the center of the town. Then, Andoni graciously offered to drive us to Bilbao, so that we would not have to take the bus there later. We told him one of the reasons we were going to Bilbao was to see the Guggenheim because we were impressed by the building, designed by Frank Gehry. He took us to see another Frank Gehry building, which is a high-end hotel in Rioja. The Hotel Marqués de Riscal is part of the luxury collection from Starwood. We didn’t go inside, but it is quite impressive just from the outside. I may have to splurge next time and stay there. The design is so unique, it is definitely a piece of art in the middle of the Rioja vineyards. Hotel Marqués De Riscal is located right in the middle of vineyards. I love the colors and unique style. After that, we were on our way to Bilbao. It was nice that Andoni had bottled water for us in the van. Pretty soon after we left I have to admit, I fell asleep. Our Rioja tour was a jam-packed day, with plenty of wine, and the van was comfortable. Russell managed to stay awake and enjoyed chatting with Andoni. They bonded especially since Andoni had also lived in England. After lunch, the wine was starting to get to me…. In conclusion, I have to admit some of the details of my wine tasting day may be a little cloudy, but I do remember enjoying every wine I tried. In addition, I am proud to report that neither of us was even hungover the next morning. It is hard to beat Spanish wines when it comes to quality for the price. And it is hard to think of a better way to spend your birthday then visiting wineries in Rioja. Andoni went out of his way to make sure we had an amazing time. Have you visited Rioja? Its one of the best San Sebastian day trips. I would love to hear about your experiences. Be sure to eat a good breakfast and drink plenty of water. Ask for the list of distributors in your local area instead of carrying bottles home or paying for expensive shipping. Look at the Rioja labels for the sticker that will give you a good idea of the quality of the wine. If you are interested in a luxury hotel in Rioja, check the availability and price for the Hotel Marqués De Riscal here. No financial compensation was received, but Basque Tours did offer a discount on our tour. As always, opinions are my own. Spanish wine is my absolute favourite as well. I would love to do a winery tour in the Rioja region. Thank you for sharing! I’m planning to head to Europe next year and this post is really handy! Soraya – Glad to hear this post was helpful. Definitely let me know if you have any questions when you start planning your trip. This is perfect!! I’m a South American wine lover myself, but yes, Rioja has to be the best out of Spain. It’s our go to Spanish wine. This trip is PERFECTION!!! I’m totally going to this one day. Thanks for planning it all out for me. Salud!! Jeanette – Glad you enjoyed the post. Rioja and Basque Country were really nice. I love South American wine too. A few years ago discovered Carmenere in Chile and loved it. I still want to visit Mendoza and learn more about Malbec! I always enjoyed discovering new wineries and new wines to enjoy. I have not had any Spanish wines that I can recall. My wife is not a drinker, so these days I have to live vicariously through articles like this. Arnie – you should definitely try some Rioja wine very drinkable and affordable too. Let me know what you think. Jessica – I’ve found with wines their is always more to learn! It was a good birthday, thank you! I am not a great fan of Spanish wines, but then I can’t brag that I’ve tried too many. Maybe I was just unlucky with the ones I tasted and I should do a winery tour in the Rioja region. Yes, I would suggest giving it another try. I really like it and Riojas are quite popular. 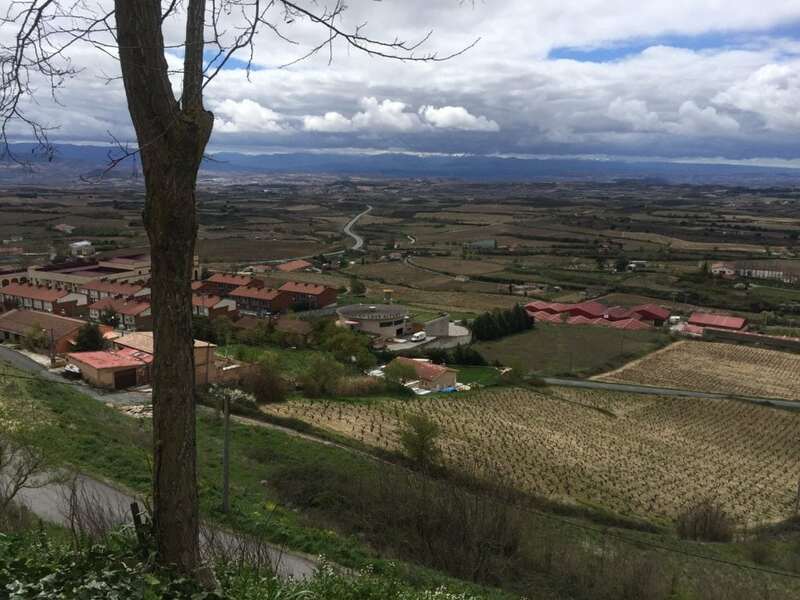 Even if Spanish wine isn’t your favorite, the scenery in the region is worth a visit. Exactly! It was a great day. Cheers! I will check the company you used for your tour. 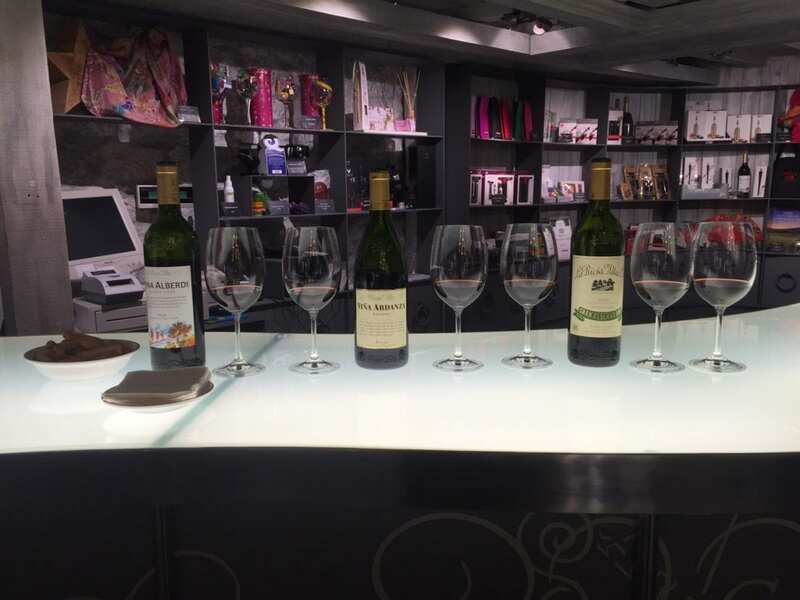 The last time I visited Spain, I found it difficult to plan a day of wine tasting independently. For what I read, you have to reserve. You cannot just drop by the tasting room an expect to get service (not sure if this is true). Yes that is true. You do have to make reservations so having a tour company to help is key. Plus, its good to have a designated driver and someone that can speak Spanish. Yes! Rioja is definitely worth a visit, I wish I could have stayed longer. Very nice, Pedro. It’s a lot of fun!